The 1300mAh EMOW Starter Kit from Kanger is the newest e-cigarette setup and is a top of the line variable voltage kit that is equipped with some state of the art features that will both WOW and satisfy you. The EVOD VV (variable voltage) battery is a strong 1300mAh Lithium Ion battery that will allow for hours of vaping before needing to be charged. 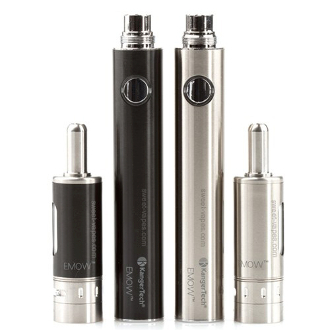 Another great trait of the EMOW VV battery is its variable voltage feature. The EMOW VV battery allows you to raise and lower the voltage with a few presses of the button, from 3.2v to 4.8v. The button will light up different colors to indicate which voltage it is set at. Red: 3.7v, Green: 4.2v, White: 4.8v. The Kanger EMOW Clearomizer is a bottom feeding, dual coil, glass clearomizer with a tank made of quality stainless steel and has an adjustable airflow control. By turning the airflow control valve ring from left to right, you are able to cover and uncover holes cut into the base to regulate air flow. You are also able to rebuild these clearomizers since they come with removable head coils to make maintenance a breeze. Press manual button 5 times within 2 seconds to turn the battery on or off. The LED light will blink to alert you that it has turned on or off. The 5-click protection feature is in place to help protect your battery from being activated accidentally. When the power in the battery is low, the LED light will flash 15 times consecutively while the button is depressed. When this happens, charge the battery immediately. Screw the battery into the USB charger. Plug the USB charger into the USB port of the EGO USB Wall Charger. The initial charge should be for 8 hours. After that, all additional charges should be for no more than 4 hours at a time. Do not leave the battery on the charge once it is fully charged. Doing so can cause damage to your battery and may cause it to malfunction or not work at all. Remember do not leave your battery unattended while charging. Turn the tank upside down and unscrew the bottom base. Fill the tank with less than 1.8ml e-Liquid, careful to keep the liquid from entering the center tube. Do not overfill. Carefully replace the bottom and screw the tank onto the battery. Turn the tank upside down and unscrew the bottom base. Unscrew the burned out coil head from the base and replace with a new one. Fill with e-liquid and replace the base.